This article is the first installment of a Street Roots investigation into the impact of criminal and traffic-related fines and fees on low-income Oregonians. For Cindy Mendoza, a 28-year-old single mother of three, getting out from under a string of traffic tickets has become impossible. It began in 2010 when she was pulled over for speeding in Wasco County on her way to The Dalles to pick up a friend whose truck had broken down. It was her first ticket, and the assessed fine was $288 plus the typical add-on fees: $37 in court fees, $30 in assessment fees, and an “offense surcharge” of $45, bringing the total owed to $400. At the time, Mendoza was 19 and living with her mother in Gresham. A recent pregnancy had forced an early end to her college career, and now she was an unemployed new mom. She had no way to pay the ticket, she said. It was sent to collections, where it doubled, eventually growing to $811. In Oregon, if a court doesn’t receive payment on a traffic ticket within 60 days, the driver’s license is typically suspended until the ticket and accompanying fees are paid in full. Mendoza’s driver’s license was suspended that June, four months after she received the ticket. She gave birth to two more boys during the next six years. She was their sole provider, and she paid on her ticket when she could. But before it was paid off, she got new tickets for driving while her license was suspended. Each ticket she couldn’t pay triggered additional notices to Oregon Driver and Motor Vehicles Services to suspend her license. 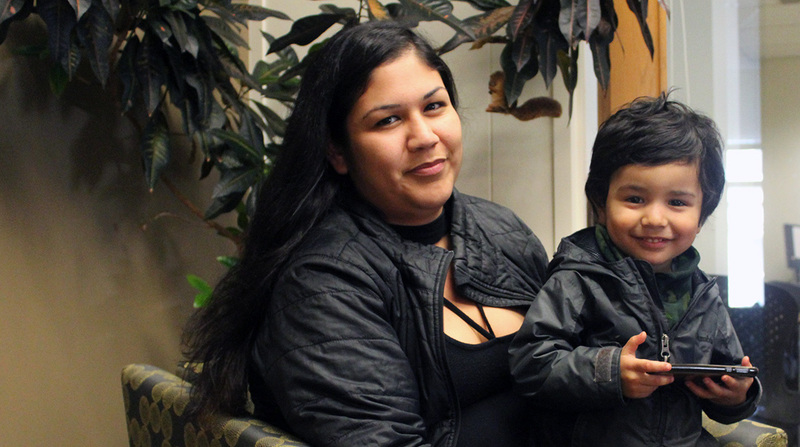 Cindy Mendoza sits with her 2-year-old son, Angel, in the waiting area at Oregon Law Center. What started as a $400 traffic fine for Mendoza snowballed into more than $11,000 in debt. A cook by trade, Mendoza worked long hours. She continued to drive when she felt she had no other choice. It’s not easy to take public transportation with young children, especially with the time constraints of getting between work and childcare. When resources run short at the end of the month, she often travels across town to access the food pantries that still have food boxes available in order to feed her family. “Taking public transportation with three kids is the most frustrating, irritating process that any person can go through,” she said. Mendoza’s suspensions were among more than 334,000 that were issued due to nonpayment of traffic fines in Oregon from 2007 to 2017. In 2017 alone, the Oregon DMV issued 90,600 driver’s license suspensions, not because the drivers were deemed a public safety threat but because they failed to comply with the courts. This typically means the driver hadn’t paid their fines in full, DMV spokesperson David House said. Behind each suspension is an Oregonian whose debt to the court keeps growing, often fed by compounding interest rates, penalties and administrative fees. Street Roots interviewed dozens of people whose drivers’ licenses were suspended because of to failure to pay traffic tickets, finding that most continue to drive. Whether to take care of a sick parent, go to and from work at odd hours or because they find public transportation unreliable in their area, many feel it’s their only feasible option. “If we are trying to get people to pay money, why would we take away their means of getting to work? Because in most parts of Oregon, as is true in the rest of the country, you need a car to go to work,” said Lisa Foster, co-director at the Fines and Fees Justice Center based in Washington, D.C., and New York. Foster is also a former department director at the U.S. Department of Justice, where she served under the Obama administration. As this often leads to additional, costly tickets for driving under a suspended driver’s license, the driver who couldn’t afford to pay the original ticket in the first place watches as their ballooning debt becomes insurmountable. Regardless of whether the debt begins with a traffic or parking ticket, a court-imposed criminal fine or even restitution, the way it works in Oregon, the poorer you are, the more you end up owing and the longer you are tethered to the criminal justice system as a result. Higher-income defendants have the means to bail out of jail, pay their fines and fees and expunge their convictions as soon as they can, washing their hands of the whole mess. A standard $435 speeding ticket might sting a little, but they can pay it and all the administrative fees upfront without having to forgo necessities such as food and heat. Meanwhile, a lower-income defendant who is unable to pay the debt within 30 days ends up owing far more than the original amount once questionably high payment plan fees and interest rates are tacked onto their bill. In all of Oregon’s county circuit courts, it costs an additional $125 to set up a payment plan if you owe between $150 and $400. If you owe more than that, it’s an additional fee of $200. She said reasonable would be $10 or $15 a month, not a payment plan that requires payment in full during a set amount of time. West Palm Beach County, Fla., reduced its driver’s license suspensions due to unpaid traffic debt 36 percent simply by implementing affordable payment plans. Naturally, tickets for driving with a suspended license have also decreased significantly. Among Oregon courts, the set amount of time that a traffic ticket must be paid is typically 12 months. If the debt goes to collections, another 28 percent of the balance due is added to the bill. After that, the debt could accrue 9 percent interest, however Oregon’s State Court Administrator has waived interest since 2007 due to challenges with calculating it accurately on over 1.4 million cases, explained Phillip Lemman, Deputy State Court Administrator Oregon Judicial Department. Municipal and county justice courts, however, play by their own rules. These courts come up with their own collections, administrative and payment plan fees – which vary widely – and many have contracts with private collection agencies that do charge a 9 percent interest rate. A low-income defendant is also more likely to spend more time in jail when they can’t pay bail, to lose their driver’s license after getting a traffic fine and to be found in contempt of court for failing to pay their probation fees. The consequences of nonpayment, themselves, come with additional fines and fees attached. In circuit courts, there’s a $15 charge for notifying the DMV to suspend a person’s driver’s license. In some municipal courts, the notification fee is higher. According to records gathered from various jurisdictions in Oregon, Mount Angel charges $35 for second payment reminder letters, and in Cottage Grove, debtors pay 10 percent extra in wage garnishment fees if the city goes after their paychecks. Some Oregon municipalities, such as Cave Junction and Burns, threaten jail time or arrest warrants for those who don’t pay their tickets. Once a debt is paid off on traffic tickets, the driver will have to pay another $75 if they want their license reinstated. That’s what Mendoza did when she paid off the ticket she was written in Wasco County five years later. But before she got her license back, she had been pulled over and ticketed for driving while under suspension in Beaverton. When she missed one $100 payment on her Beaverton debt because she couldn’t afford it that month, her license was immediately suspended again. She’d had it back for only one month. Some Oregonians whose licenses were suspended told Street Roots they’d forgone food or other necessities, such as health insurance, in order to make payments or because their wages were garnished, and this, in turn, affects their whole household. As long as a debt is owed on a criminal case, a defendant is not eligible for expunging the conviction from their record, which can affect housing and employment options. It’s a system of punishment with consequences that are harsher, farther reaching and longer lasting for poor defendants. Even those who try to make good on their debts by immediately setting up a payment plan and paying on time each month end up paying as much as 128 percent more than the original fine amount, according to the Oregon Judicial Department. In Oregon, defendants are often surprised and discouraged when they realize how greatly their debts have grown – it’s as if they had borrowed from a predatory payday lender. Mendoza was shocked to discover tickets she received in Beaverton, originally assessed at $870, had grown to more than $2,000. In all, she owes more than $11,000 to various courts for traffic-related incidents, including an accident that resulted in a misdemeanor charge for driving while suspended. But for Mendoza, it might as well be $11 million. The state of Oregon expects to collect close to $144 million in criminal fines and fees during the 2017 to 2019 biennium. In addition to traffic tickets and court fines and fees, this also includes fees for public defender services, court administration fees, interest and probation and parole fees. These fees can be especially burdensome for those coming out of prison. While their debt to society in the form of a lengthy prison sentence may have been paid, their monetary obligations are often waiting for them when they get out. With a criminal record and few job prospects, this can present additional barriers when their fees end up in collections or cause their driving privileges to be revoked. While 73 percent of Oregon’s overall criminal and traffic fines and fees are paid within 30 days of judgment, during the past 20 years, just 37 percent of felony-related fines and fees have been collected. In 2015, among more than 20,000 felony cases where a fine was imposed, the average fine was $439. Cases with restitution averaged $9,350 owed to the victim, and about half of the felony cases were billed for public defense averaging $513. And more than 75 percent had collections fees tacked on, averaging $167. According to the Oregon Judicial Department, some of the payment plans would take hundreds of years to pay off at current schedules. Some states have begun to recognize the systemic racism and economic unfairness built in to monetary sanctions, and they’re finding remedies. Oregon is one of 43 states that suspend a person’s driver’s license for inability to pay a traffic ticket. In May, The Washington Post reported more than 7 million people in the United States have lost their license for this reason. But in 2017, both California and Mississippi ended this practice, and both states reinstated licenses that had been suspended due to failure to pay. In other states, such as Montana, Michigan and Virginia, lawsuits challenging the suspension policy are popping up. This summer in Tennessee, a federal judge ruled that to take a person’s driver’s license for nonpayment of fines is a violation of the due process and equal protection clauses of the 14th Amendment to the U.S. Constitution. In September, a federal class-action lawsuit was filed against Oregon’s state transportation agencies seeking a similar judgment. Oregon Law Center is representing six clients, including Mendoza, who all lost their licenses for failing to pay their traffic violation debts. Attorneys on the case argue Oregon’s policy of suspending licenses for nonpayment punishes people for being poor, in violation of the 14th Amendment. Attorneys also filed an injunction, asking that the state immediately reinstate the plaintiffs’ licenses and cease its practice of automatically suspending licenses for monetary reasons without giving debtors a chance to demonstrate that they can’t pay. As of press time, this injunction was still awaiting a decision. When Foster was working at the U.S. Department of Justice in 2016, she sent a letter on behalf of its Civil Rights Division to every state’s court administrator and chief justice clarifying that several common state practices involving fines and fees are actually unconstitutional. Among them was the practice of suspending a driver’s license for nonpayment without adequate procedural protections. Then-Attorney General Jeff Sessions revoked the letter in December 2017. But it’s not just driver’s license suspension policies that have been targeted for potential reform due to their impact on poor Oregonians. In 2017, the Oregon Legislature passed House Bill 2238, creating the Task Force on Public Safety. Its 13 members have been charged, in part, with studying the impact of criminal fines and fees. Task force member and Yamhill County judge, John Collins, said that while the group is still in the beginning stages of examining this issue, he believes that it’s a problem and that courts need to establish better ways of determining a person’s ability to pay. Some fines and fees may be reduced or waived, but not all. Changing that would require legislative changes to Oregon state statutes. But even when a fine is eligible for reduction, that reduction is largely at the discretion of the judge, and the defendant must show up for court. Collins said many people, regardless of whether they can afford the fine, will agree to the presumptive amount, or they’re charged that amount because they missed their opportunity to go before a judge and ask for a reduction. Mendoza, homeless when she received several of her tickets, wasn’t able to attend most court dates. Twice, she and her sons were living in her vehicle at the time she was cited. Police impounded two of her cars because she was driving without insurance. Unable to pay the towing and impound fees, she never recovered her vehicles. She said she tried to explain her situation to the police, once in Portland when they took her 15-year-old Honda Accord, and another time in Milwaukie when they impounded her 2001 Jeep Cherokee Laredo. It was too difficult to get back to Milwaukie for the court date from the homeless shelter where she was staying with her three kids in tow, she said. The outstanding debt owed to the Oregon Judicial Department has increased by an average of $100 million per year, for the past five years. Part of that growth is attributed to debtors like Mendoza, whose balances owed to private collections companies increase with interest while they struggle to make ends meet. Her only income aside from about $600 in food stamps each month comes from plasma donations, although she recently applied for unemployment and is waiting to see if her application is approved. Mendoza said she knows that when she finds work again, it will just be a matter of time before her wages are garnished to pay for her traffic debts. That’s what happened in 2014 when she was working at Sandoval’s Café and Cantina inside the Portland International Airport. She was renting a one-bedroom apartment at the time for about $950 month, often getting home from work after her boys were already asleep. When she first discovered her wages were being garnished, she said, she cried. She said that was when things really started to slip. When she lost her job at the airport, she became homeless, and the vehicle she was not allowed to drive became her family’s home. While $144 million in criminal fines and fees that the state will collect this biennium may seem like a lot, it’s just a drop in the bucket of the $1.7 billion that’s actually owed. The Oregon Judicial Department estimates that only 15 percent of that balance is collectible. Of accounts where driver’s licenses are suspended due to nonpayment, collection rates are also low. In the Central Oregon city of Veneta, for example, 35 licenses have been suspended for nonpayment since January 2014, but only 4 percent of the fines owed have been paid. In the city of Yamhill, just 2 percent of fines and fees owed on 98 suspended licenses have been paid during the same period. With so little of Oregon’s outstanding criminal and traffic debts being collected, while at the same time causing so much strife in the lives of low-income debtors, it begs the question: Are Oregon’s monetary sanctions causing more harm than good? Throughout November, Street Roots will attempt to answer this question. We will examine how far the scales of justice have tipped against those with lesser means, and we will ask what the imposition of these fines and fees is accomplishing and where the money is going. Ultimately, we’ll ask: How do we balance the need for court funding and accountability with the responsibility to reform Oregon’s justice system into one that’s equitable?